The gold dollar was coined with three major designs from 1849 through 1889. All types were the work of James B. Longacre, the Mint's chief engraver from 1844 until his death in 1869. The first type was struck as late as 1854 and depicted the same bust of Liberty seen on the double eagle, or $20 gold piece. The reverse featured a slim wreath formed of two olive branches. 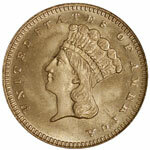 These Type 1 gold dollars were slightly smaller in diameter than the later types—too small, in fact, to be practical. The Type 2 design was transitional, appearing first in 1854 and coined through 1856. Liberty had the same profile, but now wore a feathered headdress. The wreath was enlarged, and blended corn, cotton, maple leaves and tobacco. 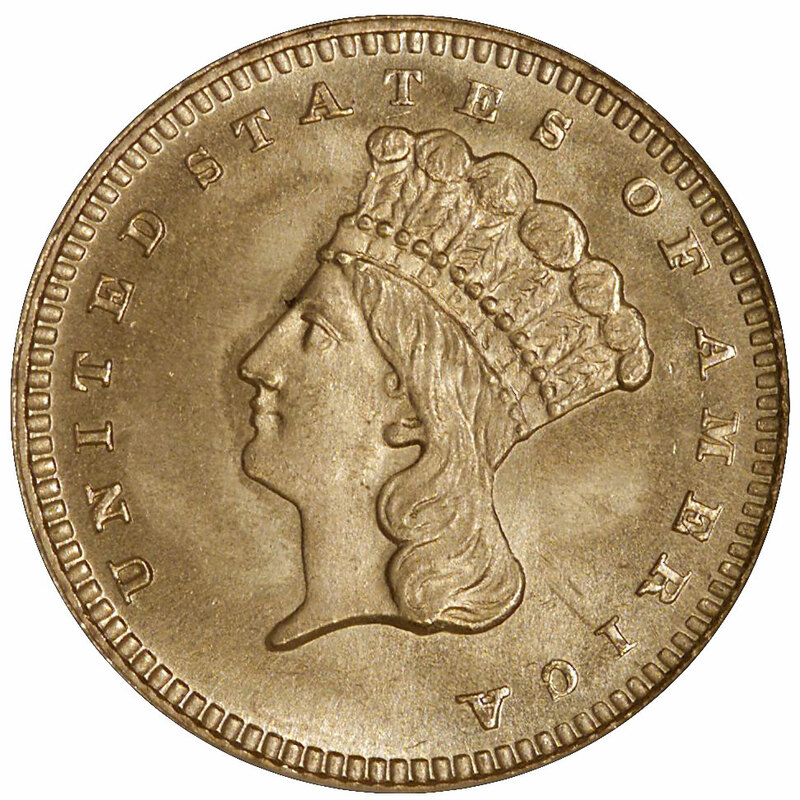 The Type 3 gold dollar borrowed its design from Longacre's three-dollar piece of 1854 and featured a remodeled portrait of Liberty with a feathered headdress and a broader, lower-relief head. 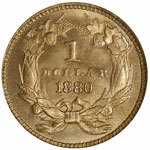 Coins of this type debuted in 1856 and were struck as late as 1889. Grading circulated examples is fairly easy when they are well struck, such as coins issued by the Philadelphia Mint. Just follow the text and photographs in The Official American Numismatic Association Grading Standards for United States Coins. Branch mint gold dollars, however, are more challenging. For the most part these coins are softly struck, often from worn or rusted dies. These problems are particularly severe with Charlotte and Dahlonega Mint coins, as conditions at those facilities were rarely optimum. San Francisco and New Orleans Mint dollars are less troublesome. How do you grade such coins, when the details described in the grading book never were evident from the start? Put simply, wear is wear, and it will reveal itself on the highest points of a coin's relief and in the unprotected areas of its fields. The amount of wear detectable, regardless of how it affects the visible detail, often is the determining factor. So, too, is the amount of luster, yet luster can be impaired through injudicious cleaning, even on a high grade coin. Sadly, many if not most early gold coins display signs of such mishandling. If the cleaning isn't noticeable enough to hamper a coin's desirability, this will not prevent a grading service such as NGC from certifying one of these early pieces. Grading mint state gold dollars is even more challenging. A low-power magnifying glass of some sort is almost essential for grading such small coins. 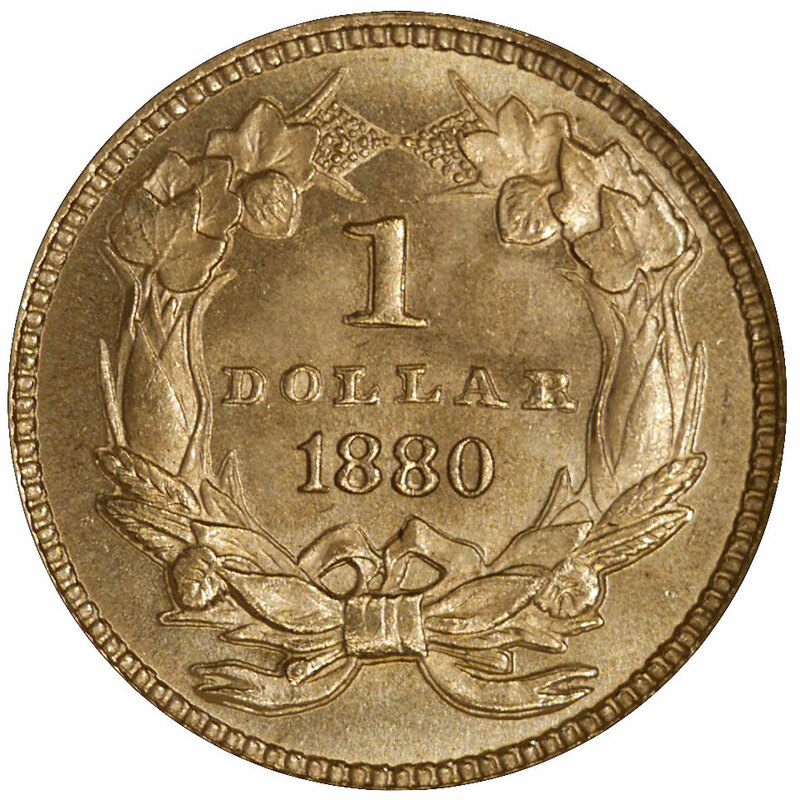 All gold dollars are subject to softness in the date area, and this is particularly true of the Type 2 dollars. The part of any gold dollar most susceptible to contact marks and abrasions is Liberty's cheek, as this is the highest point of relief and most exposed surface for all three types. One or two small marks on a mighty double eagle can pass without notice, but on a tiny gold dollar these can cause rapid downgrading. Basically, the ratio of surface disturbance to surface area determines how readily a given number of marks affect the grade assigned, though their location is also important. A mark hidden within the wreath or Liberty's hair is of less consequence than one on her cheek or in the open field. Gold dollar proofs constitute an area all in themselves. Most are quite sharp because they were struck under higher pressure, but some reveal the same deficiencies found in business strikes, though to a lesser extent. Those coined from the mid 1870s through the mid 1880s often are not as well made as those from other years. Incomplete or overpolished dies (with resulting loss of detail) and even rust pits in the dies are not unusual. As with any coin type, damaged or obviously cleaned pieces will not be certified by NGC. Since so many coins of this denomination were mounted for jewelry, the numbers ineligible for certification are substantial. Still, the series remains collectable by date and mint because enough desirable coins have survived for all but a few of the issues.